« NOFA and NAFTA and Dicamba, oh my! As some of you may have heard the FSIS of the USDA is threatening Maine’s landmark food sovereignty law. The Governor has called a special session of the legislature to deal with this threat. Heather Retberg, one of the leaders of this movement in Maine, has written the following. I would just like to add: don’t despair we have been in darker places before this, we will move forward and protect the people’s right to local, healthy, culturally appropriate food. The USDA (FSIS) has sent a letter to the governor stating that our food sovereignty law is ‘non-compliant’ and they will take over Maine’s Meat and Poultry Inspection (MMPI) making us a ‘Designated state’. There are a series of letters that have already been sent between FSIS (Food Safety and Inspection System) and the Quality Assurance & Regulation division of our Dep’t. Of Ag outlining details. We don’t yet have access to those letters. This is the exact scenario that first led us to local governance and the necessity of asserting our food sovereignty at the local level for traditional foodways & exchanges between individuals. The USDA-FSIS was claiming jurisdiction over our lowest risk, direct-to-patron food exchanges, and we said ‘no’. We carved out the legal space to protect what had traditionally belonged to people, not governmental agencies run by corporate food entities. Now that farm patrons and small farmers have stood up together in communities all across Maine, and now that the state of Maine has recognized municipal authority to regulate those food exchanges, the USDA is threatening our state’s fragile meat processing infrastructure. What can be said about it? I see it this way right now: when a bully threatens you if you don’t hand over your milk money, what do you do? Fight back. When the rules changed around poultry in 2009 and so soon afterward the policy changed toward small dairy farmers selling milk directly to customers from our farms, we fought back. We went on the offensive and kept the rule of law behind the work of our small farms and dairies and our customers’ access to foods our their choosing. The state re-instated our legitimacy by recognizing food sovereignty in June of this year. What do you do when the bully threatens to beat up your friend if you don’t hand over your milk money? That is more difficult. First and foremost, we need to find out if ‘Designated’ status WOULD harm our fragile meat processing infrastructure here in the state. And…just what the impact of a USDA takeover would be. Along with VT, we are the only 2 states in New England that still retain a state level meat and poultry inspection. It isn’t super clear right now, when states must make rules “equal to” the federal rules, how much different the practice of having a USDA trained state inspector would actually be. Under the steps outlined in the USDA guidance on becoming a Designated state, the USDA offers to train existing state inspectors. So…”equal to” federal rules are required, same person would potentially be inspecting, but different badge. It is likely, however, that the small processors would be required to add additional building infrastructure to be compliant which would pose additional expense. The USDA has thus shifted the pressure from small farms and farm patrons directly to the meat processors. So…we’re learning fast and furious, working closely with our legislative allies and reaching out to legal resources within our food sovereignty/food freedom circles. It is a tight, small place between a rock and a hard spot. That is where we are right now. ~Contact your legislator and let them know you want them to stand up for food sovereignty without harming our processing infrastructure. Encourage them to find creative ways to maintain our hard-won victory for small farms, while supporting our small meat processing infrastructure. ~Why the rush? It is highly unusual to call a special session to amend a law right before it goes into effect. None of this information was brought to bear during the public hearings, work sessions, floor debates or the rest of the regular legislative process. Encourage your legislator to urge that this motion be defeated in the special session, but taken up under the regular session when a more careful, deliberative process can be undertaken by committee. ~Write the governor urging him to do all in his power to not cede local jurisdiction of our food supply. We are the first state in the nation to recognize local rules for local food and other states are looking to Maine now to do the same. Thank him for his original support of the law ensuring the state recognition of local control of our food system and urge him to stay the course. 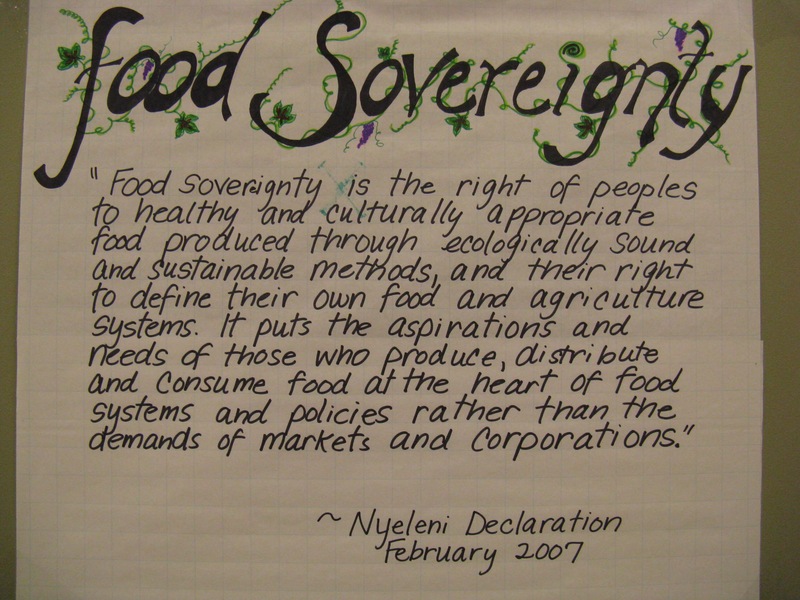 ~Think about what you are willing to do as a movement to protect food sovereignty. If the USDA/Big Ag prevails, what are you willing to do to protect your access to farm-raised foods from farmers in your community? Stay tuned. We’ll need all of us reaching out, pooling our resources and networks, standing together for local rules for local food as this proceeds. We need to line the halls on the day of the special session (not yet scheduled) to demand a balanced approach to this process. The state of Maine has officially recognized local control of local food. The senate voted unanimously in favor, the house voted by a super majority in favor. Governor LePage signed the bill on June 16, 2017. Our entire legislative process is now under threat by a federal agency inhabited by the meat monopolies and Big Ag corporations. They stand to lose the most as more Maine communities (up until now ‘their’ market) ensure greater food security by growing and processing our own chickens, sheep, goats, beef, and pork. We know more states are looking to Maine to enact this in their states. The USDA is threatening our small meat processing infrastructure in Maine to put a stop to the spread of food sovereignty across the country as more people learn and re-learn how to pick up and use the tools of democracy and local governance to grow our own food security right in our back yards and farms.